These are some hand prints my husband, myself and my twin daughters did nearly fourteen years ago. 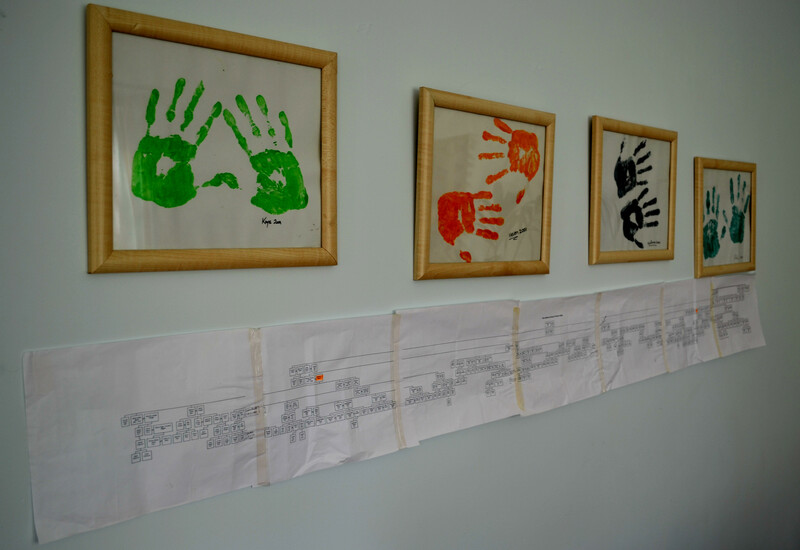 We had great, messy fun producing them, and at the time, made a conscious decision that we should each make our hands into a different pattern, as well as using a different colour. Thus, they are different and yet the same – much like us as individuals.They have been gracing my walls ever since. Underneath I have pinned the scroll of my extended family tree which goes back over 200 years. There are many that are long since dead, and even some more recent relatives that I have never known. Nevertheless, we are still connected by a blood line, and keeping a record of their names means that their connection to us will continue to be remembered by future generations.